Dubai, United Arab Emirates – October 8, 2018 – InfiNet Wireless, the global leader in fixed broadband wireless connectivity, will showcase its record-breaking spectral efficiency solution at GITEX Technology Week, Dubai, UAE to be held from October 14th to 18th. Addressing the increase in Internet of Things (IoT) applications and the rising number of connected devices requiring more reliable bandwidth, InfiNet’s brand new 5 GHz Point-to-Point (PTP) solution, the Quanta 5, has been specifically designed to offer the highest spectral efficiency available in today’s wireless marketplace. Overcoming many challenges such as eliminating interference in noisy radio environments and delivering more Mb/s in less radio spectrum, the Quanta 5 is able to operate in sub-zero temperatures as well as extremely hot conditions, ensuring at all times, that the data is transmitted reliably and delivered across large distances. On display on stand Z2-C8, the solution is based on the latest Software Defined Radio (SDR) technology designed entirely by InfiNet’s R&D teams and is ideal for the transmission of high-resolution video streams, the provision of Internet and Intranet access, and for backhauling all types of traffics whether generated by a Wi-Fi access point or a service provider’s 4G/LTE base station. The Quanta 5 boasts a considerably higher performance compared to previous platforms, making it ideal for any service provider considering the launch of new applications and services aimed at catering for current and future 5G / IoT requirements. 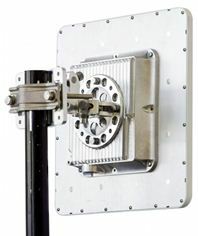 An all-in-one package to enable operators of all sizes to quickly deliver high-capacity premium services to their corporate clients, to interconnect their network nodes wherever they are located, or simply to provide internet connectivity to end users, the Quanta 5 can also be deployed as part of a wide area network (WAN) to connect remote locations to the main control and operations centres. Other solutions on display alongside the Quanta 5 will include the latest generation of the field-proven InfiLINK XG product family. Available in new frequency bands, the InfiLINK XG is the ideal solution for unlicensed and licensed backhauling in multiple bands such as 2 GHz and 3 GHz for legacy WiFi/WiMAX replacements, or 4 GHz and 6 GHz which are licensed frequencies depending on specific countries. Building on these capabilities, the InfiLINK XG 1000 doubles the capacity of the previous XG platform up to 1 Gbps. By supporting two non-adjacent 40 MHz channels instead of a single 80 MHz channel, the XG 1000 can provide connectivity over distances in excess of 60 km, delivering unparalleled reliability and scalability to meet both current and future demands.